What Is a “Fully Engaged Customer”? What Is a “fully engaged customer”? That’s a very good question! Some of the answer depends on who you ask. Marketing has one opinion, Sales generally another and then Customer Service might see a fully engaged customer from a whole different point of view. Sharing is Caring. If a customer is talking to you – whether online or in-person, there’s engagement. If they are sharing a compliant, don’t see it as a compliant. See a compliant as an opportunity to understand, from their point of view, what’s working and what’s not working. Then you will be able to help them with relevant information in the context of their experience. That’s engagement. Make sure if you are in sales, you are listening online to what customers are saying about the products and service that you offer. Listen to what they say about your competitors. Why? because customers, whether B2B or B2C are talking to each other about your product and services (and your competitors) and you need to know what they think before you try to sell them something. And if there’s something that’s really not working about your product or service, you need to communicate that back into the organization so the issues can get handled. 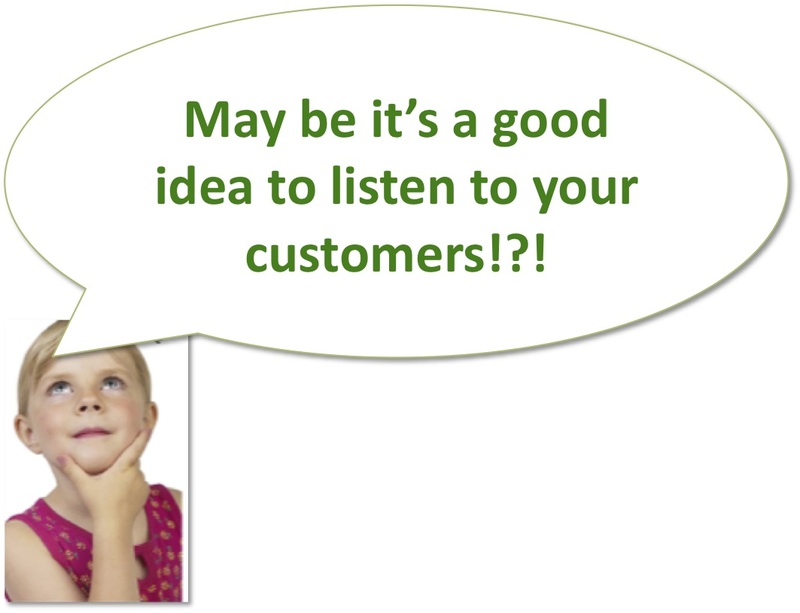 If you are in marketing, you will also want to be listening to customer conversations. You’ll not only find what is relevant to them, but be able to take that information and use to to craft your marketing messages and in messaging, you’ll be able to combat sales objections, product questions, and really be of service with your content. That will make you relevant in your customer’s eyes and entice them to be fully engaged. In this webinar with Crimson-Hexagon, I walk through seven steps that help brands create powerful customer experiences as well as where the ROI is… which seems to be difficult for some people to see where the return on integrating social media into a business is possible. Here’s the link to listen to the webinar. 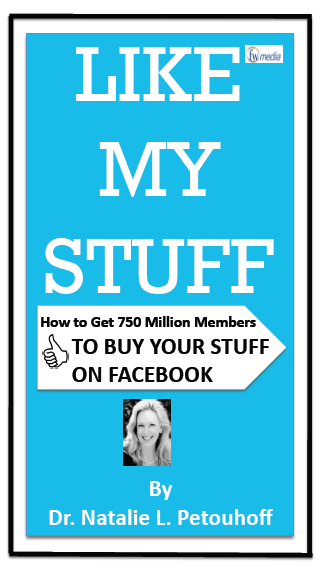 In particular, I show how social media monitoring is key to a social media business strategy. MediaPost released the results of the Chief Marketer 2012 Social Marketing Study, a survey of marketing professionals. While 76% of respondents are currently using social media as part of their marketing, they expressed several frustrations. SalesForce has pulled together some takeaways and resources to help marketers overcome these social media obstacles. At 56%, this was the biggest frustration for marketers. While social media metrics on their own do not ROI make, correlating these metrics with overall business objectives will allow you to calculate the return on investment of your social media efforts. We go over the fundamentals in 7 Steps to Measuring Social Media ROI and cover seven essential equations for social media measurement. If you have more time, check out the below webinar on ROI with and be sure to download the ebook. When linking social media metrics to sales, you need to look at conversions or the number of people who took action as a result of your social media efforts. Create landing pages and promo codes available only via Facebook or Twitter and use web analytics to help track your referral traffic. You can also cross-reference inbound leads with your social media subscribers to measure conversation rates for your customers who follow you on social media versus those who do not. A CRM system will help you track your lead sources and how many convert to sales. For more on this, download SalesForce’s ebook, 5 Steps to Effective Social Media Measurement. While some brands and agencies have full-time teams dedicated to producing content, it is an achievable goal for brands of any size. Creating content takes time, but doesn’t need to be time consuming if you delegate your resources. We give you some ideas for how to organize your social media editorial team here. If your team is small, consider having members from other departments in your organization create or collaborate on content, whether it is a blog, ebook, or webinar. You likely have lots of employees outside your marketing team who would be willing and eager to help out. Don’t rely on your internal team alone – turn to your customers and industry influencers to contribute as well. Lithium was recognized by Gartner, Inc. in the Leaders Quadrant of the Social CRM Magic Quadrant. Here’s the links to the press release: Lithium Press Release. The Gartner Social CRM Magic is an annual report tracks trends in the Social CRM market and analyzes key market qualities. Lithium’s inclusion in the Magic Quadrant is based on Gartner’s evaluation of the company’s ability to execute on social strategy and overarching vision. Lithium is the only non-public company among the leaders and contenders in this space. In addition, the Wall Street Journal named its third annual ranking of the top 50 start-ups in the U.S. backed by venture capitalists. http://on.wsj.com/ScG7ij Lithium was named part of the Next Big Thing. In looking at the Gartner Magic Quadrant, I wonder how easy it is to use it to choose software to build a social enterprise. Having been an analyst, I know how difficult it is to keep track of all the regular vendors- for instance, I covered CRM – Marketing, Sales and Service software and then added social media software as applied to those disciplines. Covering 100 or more vendors is nearly impossible for any human being. On the other hand, I wonder how useful it is to have a report that has many software types that are not apples to apples comparisons. 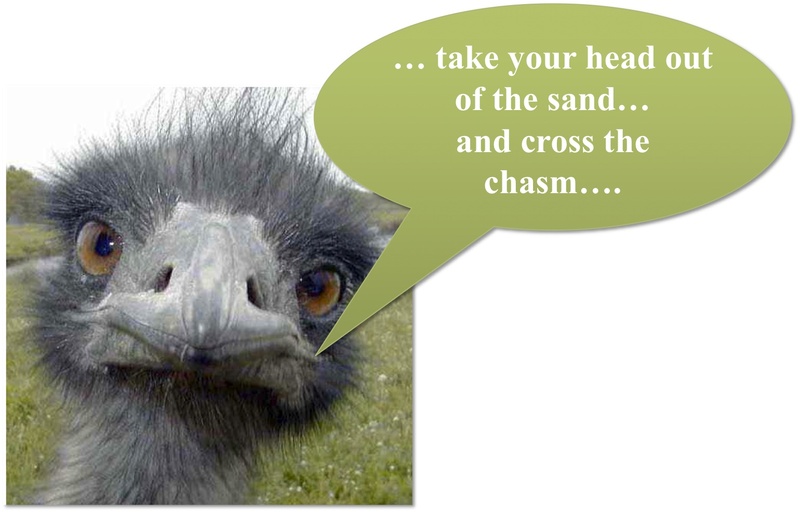 I don’t mean to say that Lithium’s placement in the Social CRM Magic Quadrant isn’t well deserved. It is. For me, what I am wondering about and pondering questions around – is how to make sense of all the content and information- sometimes misinformation about software, especially when it comes to social software. Maybe one strategy is to write a software analysis document that is not very clear or one that does not completely covers the whole landscape (which is not possible) or one that doesn’t have apples to apples comparisons – with respect to building a social enterprise– so that people need to call you and get help? Could that be part of the reasoning? What’s your thoughts on figuring out the social media software landscape? Lithium helps companies unlock the passion of their customers. Lithium software powers amazing Social Customer Experiences for more than 400 iconic brands including AT&T, BT, Best Buy, Sephora, Skype and Telstra. Lithium helps companies grow brand advocacy, drive sales, reduce costs and accelerate innovation to create a brand nation that redefines the customer experience. For more information, visit lithium.com, or connect with us on Twitter, Facebook and our own brand nation–the Lithosphere. Lithium is privately held with corporate headquarters in Emeryville, Calif. and offices in Europe, Asia and Australia. A complimentary copy of the Magic Quadrant report here. The “Magic Quadrant for Social CRM” was written by Adam Sarner, Ed Thompson, Jenny Sussin, Nikos Drakos, Michael Maoz, Jim Davies, Jeffrey Mann — September 27, 2012. The Social Media Club/LA (SMCLA) today announced it will present, in cooperation with sponsor SAP, a panel discussion on social customer relationship management (CRM) titled “Loving Your Customer.” In this second SMC_LA presented panel discussion of the year, speakers will highlight how customers can tap into the latest mobile trends to get the most benefits from their social programs. The discussion will take place on Tues., Feb. 21, from 6-10 p.m. at the ING Café in Los Angeles. Dr. Natalie Petouhoff, president of SMCLA, will moderate the discussion. She will be joined by speakers Jon Ferrara, CEO of Nimble; Gary May, president of Interactive Marketing and Consulting Services (IM@CS); and Charles Miller, director of Digital Care and Social Media, Mobile Smartphone at Direct TV. To learn more about the presentation or to RSVP, please go towww.socialmediaclub.la. The Social Media Club of Los Angeles focuses on the unique mix of entertainment, technology and culture that makes Los Angeles an epicenter of the next evolution of the Internet. It hosts monthly panels on topical and relevant social media issues. Its February panel discussion will be presented in sponsorship with SAP, the market leader in enterprise application software, which also offers leading social CRM solutions. SMCLA is a non-profit, volunteer-based club. Members of SMCLA include influencers throughout the Los Angeles community who range from tech, marketing, PR, entertainment, entrepreneurs, and media to name a few. SMCLA panels typically draw 100-150 in-person attendees and when livestreamed, an additional 400+ who tune in via our video webcast. Our panels have already covered the movie and music industries, branding in Social Media, search engine marketing and more. The Social Media Club of Los Angeles focuses on the unique mix of entertainment, technology and culture that makes Los Angeles an epicenter of the next evolution of the Internet. Founded in July of 2008, SMCLA hosts monthly panels on topical and relevant Social Media issues. Image via Wikipedia Jon has over 20 years of experience in Customer Relationship Management (CRM) and Sales Force Automation (SFA). An entrepreneur at heart, Jon founded GoldMine CRM in 1989 with a college friend and turned it into a very successful venture that he eventually sold to FrontRange. Today, business has changed. With the advent of social media, email, IM, text messages and more, businesses are overwhelmed by the myriad applications needed to listen to and engage with their customers. The question is no longer how to stay connected – but how to efficiently and cost-effectively build business relationships given multiple communication channels. From that new need sprang Jon Ferrara’s latest innovation: Nimble. After two years of development and thousands of real world users, Nimble has emerged as the next evolution in relationship management – the only web-based solution that brings together all of your contacts, calendar, communications and collaborations in one simple, free platform. IM@CS continually evolves to build, educate on and support platforms in critical sales, branding, process, media and best practice application for forward-thinking companies and those trying to grasp the online space. We work with retail, manufacturers, portals and service providers that have a large consumer-facing business, primarily in the automotive industry as well as luxury and specialty markets and other high-end services. IM@CS also specializes in working with companies investigating opportunities within the automotive market to make sense of a diverse and dynamic environment, providing insight, direction and solid fundamentals to achieve success. Overall we provide greater opportunities through brand awareness, reputation management, process improvement and sales organization coaching for companies looking to create sustainable improvements and add to their bottom line. Charles Miller, Director, Digital Care and Social Media / Mobile Smartphone Support Strategy, DIRECTV, Inc. Image via WikipediaA leading Social Media practitioner, speaker and panelist, Charles has advised CMOs, CIOs, and CTOs on Social Media best practices, sCRM, and customer communities nationally. Within DIRECTV he has influenced and helped employ Social Media use throughout the enterprise including advising PR, Marketing, Engineering, Research, Field Services and Mobile Advanced Services. His operations team is both U.S. and internationally based with overseas travel to Manila, Hong Kong, London, Paris and Rome. Dr. Natalie Petuohoff Dr. Natalie, a former social media Forester Analyst, heads up the Social Media Executive Education Division at UCLA and is President of the Social Media Club Los Angeles. Her experiences as an Ad Agency executive and management consultant provides unique business insights that she shares as an accomplished keynote speaker, quoted expert and featured guest expert on TV and radio. Dr. Natalie helps companies understand how social media affects the bottom-line and to create executable strategies that provide real business value. She does this by benchmarking the “As Is” state of social media initiatives and compares them to “Could Be” via best practices. With this insight, businesses can create a world-class social media and digital presences and monetize their investments. 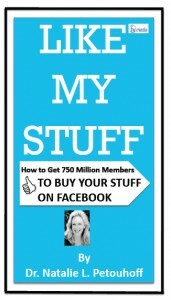 Dr. Natalie wrote the world’s first social media ROI calculator. Could Social Media Monitoring Have Saved Netflix & Blockbuster from Themselves? 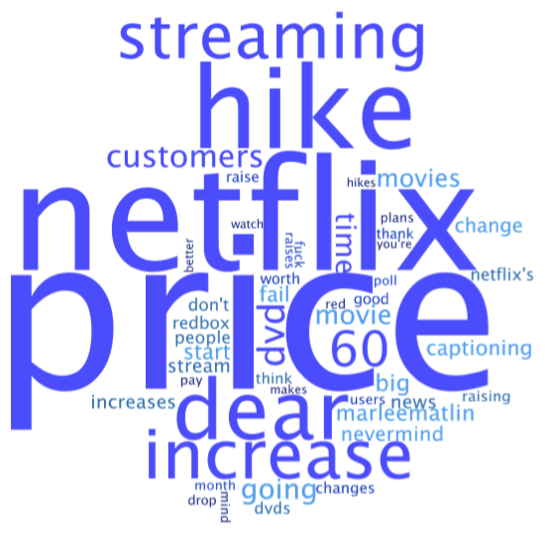 I teamed up with my friend Jennifer Tyler, @JenHowell4, at Sysomos and we did a little social media monitoring on the Netflix situation. One of the goals of this blog post is to show that data can be used to tell a story. When you tell a story, the audience listens. A Cause for Pause I hope that this case study gives every CEO, CMO… a cause for pause — to consider social media as well as social media monitoring –to give it a real, hard consideration. Not just because you want to avoid risk, but because you can begin to see that there is mission critical, real-time data that you can use in your business. And so now to our story, aided by the social media monitoring data. 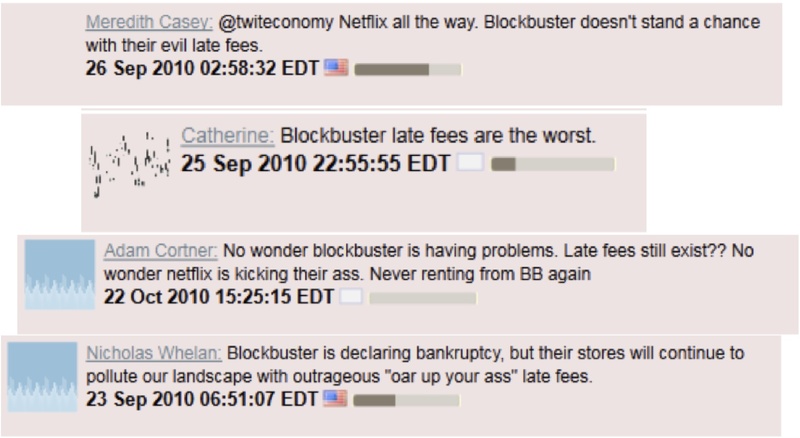 Blockbuster’s Customers Didn’t Like the Delivery System Because It Involved Late Fees If we examine what was being said about Blockbuster in social media prior to bankruptcy, the negative conversation was around late fees. Clearly there was something not working about the delivery of movies. Customers had to come in, rent the DVD and remember to return them on time. Or else the “evil” late fees would consume their positivity around the brand. If Blockbuster was using social media monitoring, they could have seen that their customer sentiment was not positive. They could have clicked on the red part of the pie chart to understand what customer’s were upset about. By clicking on the graph they could choose to look at tweets, at blog posts, etc… that pertain to that negative sentiment. But Blockbuster didn’t listen — or at least they didn’t hear and shift their business and had to file bankruptcy on Sept 23, 2010. 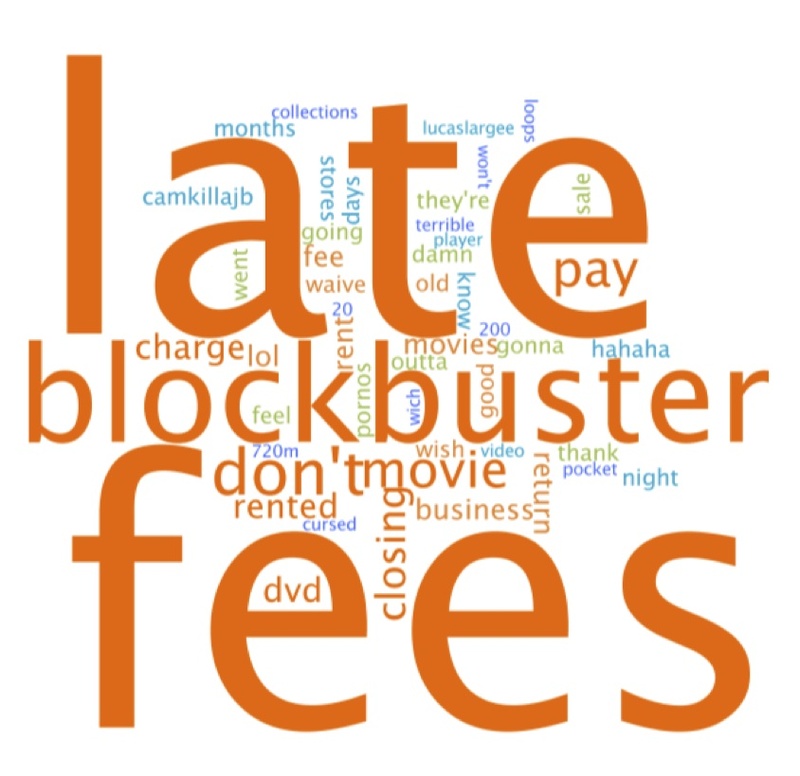 You can see in the word cloud about Blockbuster’s bankruptcy, that Netflix is showing up in the conversation. 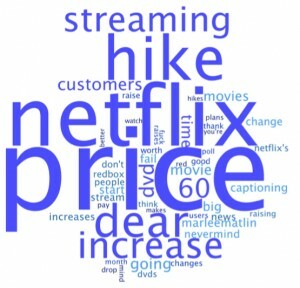 Clearly something to pay attention to — when the word cloud is supposed to be about your business and your competitor is showing up in the same cloud! YIKES! 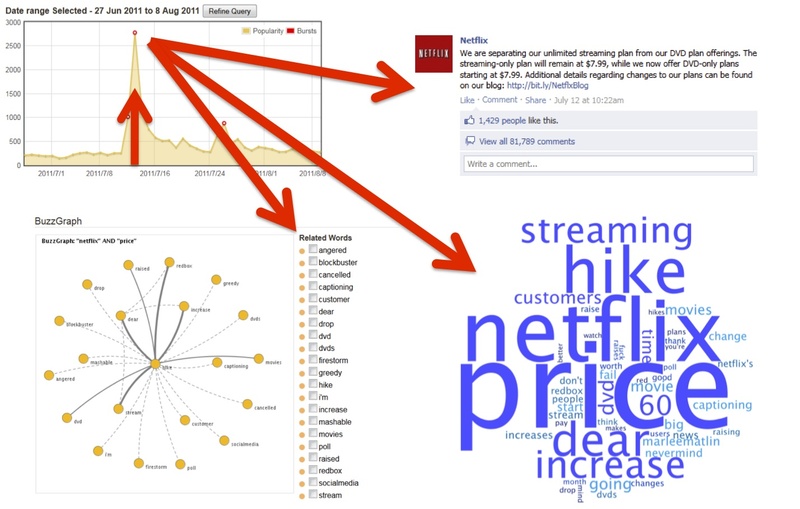 Social media monitoring can show you what is being said about your company. 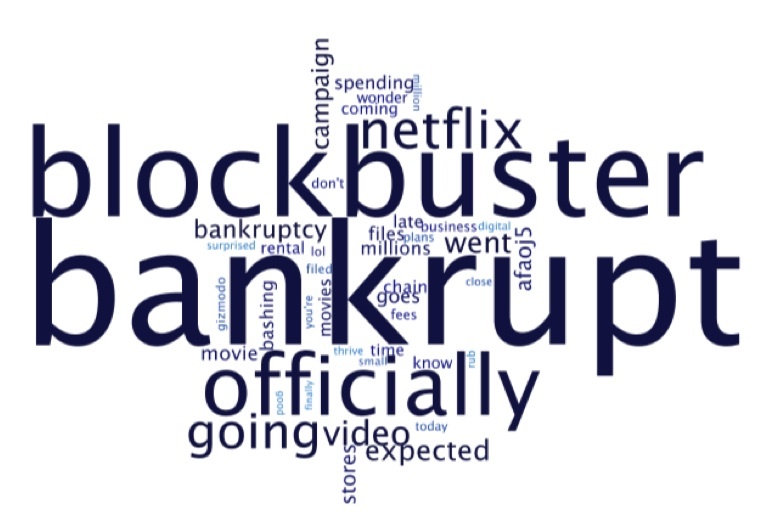 Below are clips that represent blog posts in social media about Blockbuster’s bankruptcy. July 12, 2011 Flash Forward to July 12, 2011. Was Netflix listening to their customers? If you look at the graph at the top left hand side, you see a yellow-ish curve. It is pretty much the same height until July 12, 2011. What you can do in social media monitoring is to click on the peak and then see what that is attributed to. 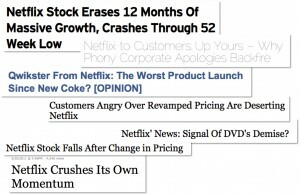 In the upper, right hand corner, you can see the blog post by Netflix’s CEO Reed Hastings is what gave rise to the spike in social media and online conversations. The screenshot is of the Facebook post with a link to the CEO’s blog post. There are 81,789 comments. Out of those comments, there are 1,429 Likes. That’s about 1.7% positive responses. 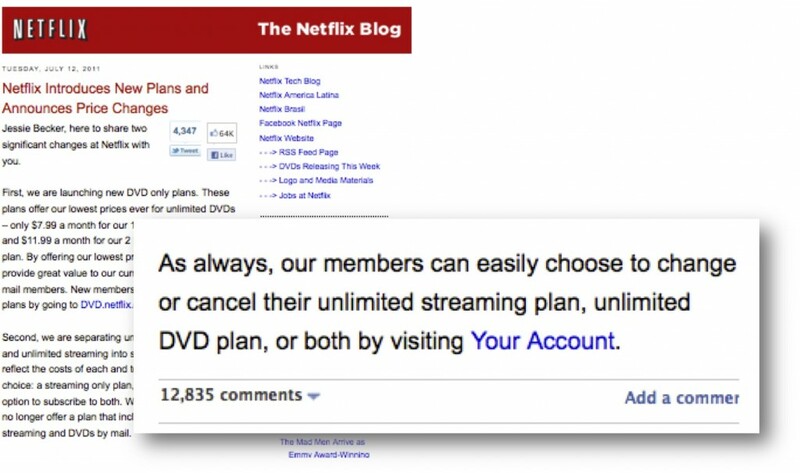 Here’s the actual blog post by Hastings— note that he ends the post with telling customers that they can cancel their services at any time. Despite the >23,000 negative comments on the blog on July 12, 2011, Netflix sent out a notice on the price hike on Sept 19th, 2011. What happens when you don’t listen or hear & you act without considering what customers think, feel and know? Customers were outraged… and the press picked up the coverage… If for no other reason than the press looks to social media for stories, companies MUST start taking social media seriously. And here’s some of the titles of the articles below. Companies work very hard to get coverage like this. Unfortunately, it wasn’t positive coverage. Here’s a sample of the tweets about Qwikster (Netflix’s new offering) – Sept 19th, 2011. 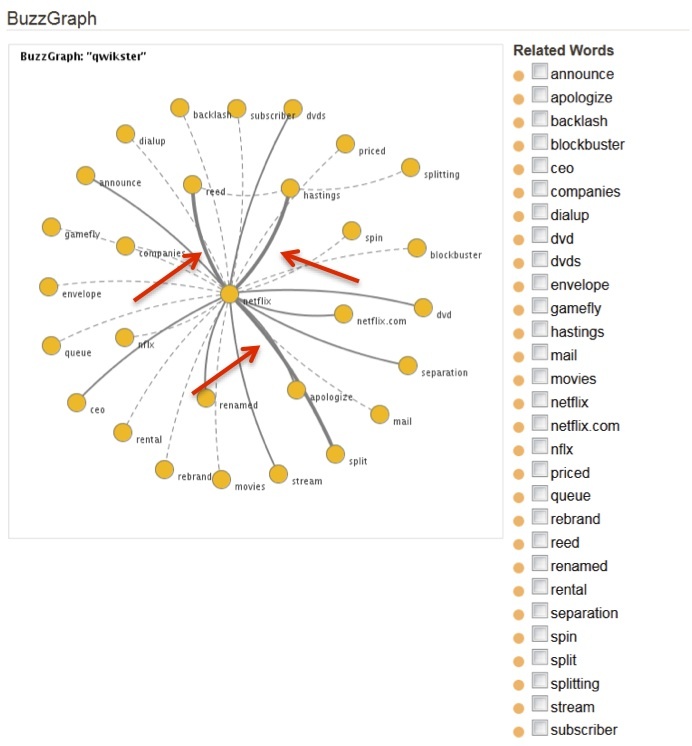 And the three top words in the Buzz Graph? 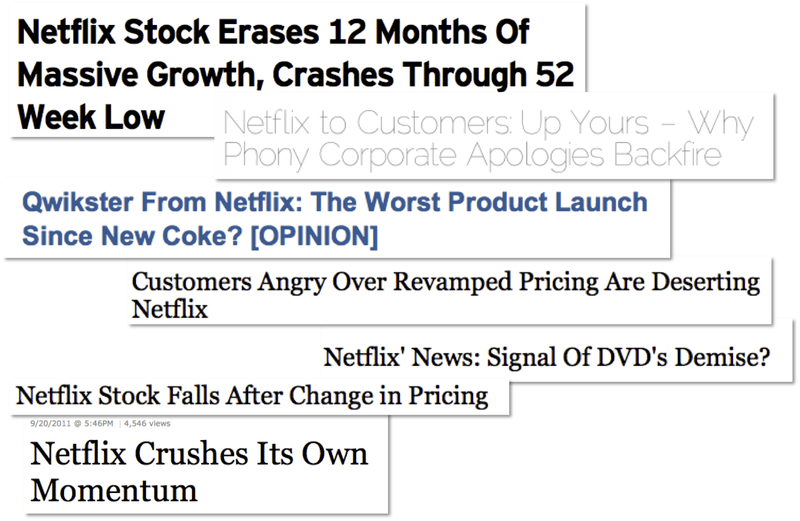 Ben Fritz, LATimes: Netflix CEO admits ‘arrogance,’ renames disc business Qwikster Mark Memmott, NPR: Netflix’ News: Signal Of DVD’s Demise? Deming On Steroids Maybe its good to listen to your customers. Deming said it years ago. Listen to your customers and employees. Take the feedback and integrate it into your company. What we have in social media is Deming on steroids. We have feedback that is honest, genuine, and transparent. What’s worse is that, like cave paintings, it is something that will last forever for whomever is searching to find it. 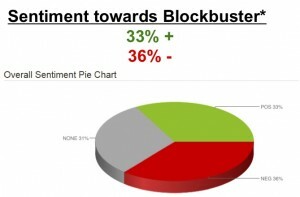 Did Blockbuster cross the chasm of it’s time? No. It’s customers were saying, “We want a different delivery system where we don’t get dinged for late fees.” It didn’t shift with the changes in the marketplace. Did Netflix take their spot. You bet. 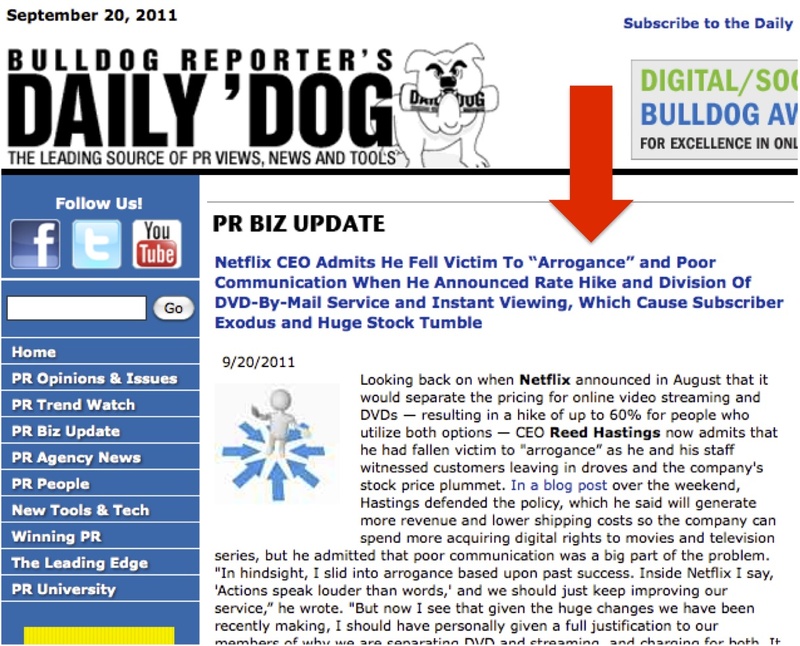 Did Netflix get arrogant? 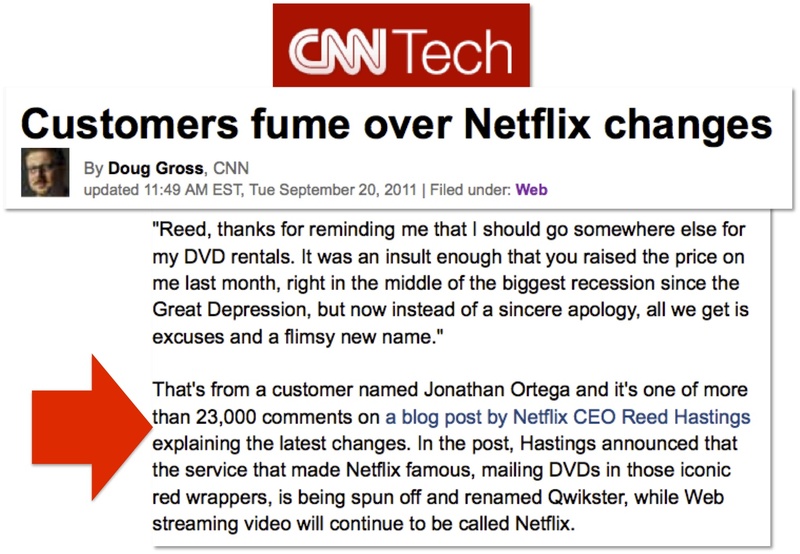 One would think that after >87,000 comments or 24,000 comments, that if the customer’s weren’t good with what was being proposed, and Netflix went ahead anyways, yes, it appears so. What could Netflix have done better? Ask the customers what they think before making a declaration. Explain that to keep the company profitable and to keep delivering the streaming services, that there might need to be some changes. Ask, don’t tell is the VERY FIRST things good leaders learn in and out of business school. Asking vs telling would be a paradigm shift for most CEOs. 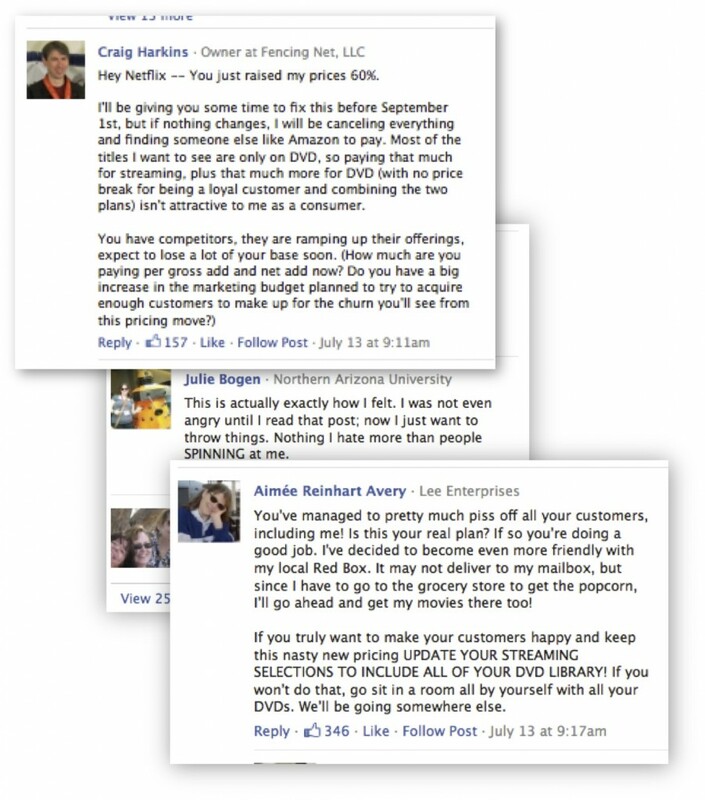 Netflix announced the deal with Facebook and Michael Drobac, director of Government Relations at Netflix is asking customers to help bring Facebook Sharing to the US. Has Hastings done so much damage that fans and customers will not rise to help? 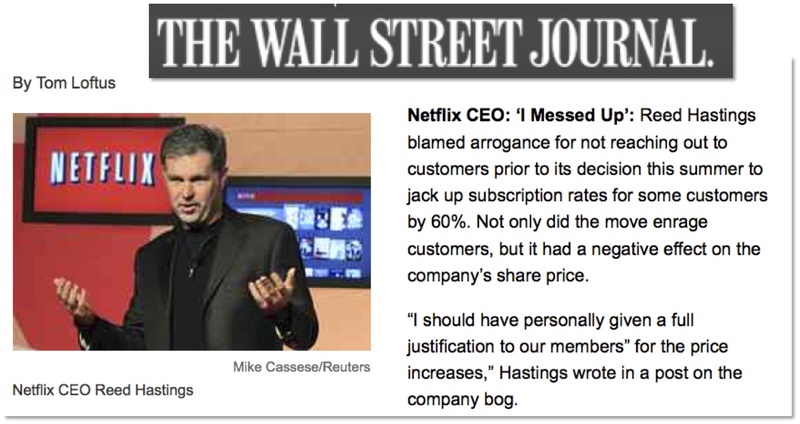 Did the apologies and explanations by Hastings help or hurt the company? Do you think Hastings understands what he did wrong? 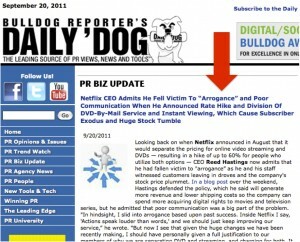 Todd Wasserman of Mashable.com reported rumors of Blockbuster to launch a Netflix rival. Is it too late for Netflix? A Social Media Teaching Moment What can we learn from this? Call it a “teaching moment.” We can conclude that’s its important to listen to our customers. It’s important that executives listen to customers and use that feedback to make good decisions. The information about a company that is contained in social media is real-time and real relevant. It’s your customers, your advocates, your influencers, your ambassadors, the press and your nay-sayers giving you their point of view. And it lives forever, it can go viral and change not only what customer’s think but also what investors think, as well as stock prices. Social media is clearly a medium, that if you don’t understand it, it can get you! And give you data that can be used to calculate social media ROI. Where is Social Media Going? Many people are asking me what’s the next phase in social media? They’ve got their Facebook and Twitter handle and they are posting. They have somewhat of a content strategy and interaction plan. And they are trying to drive customers through a marketing funnel and help customers with their customer service issues. The Third WAVE of Social Media Adoption The next phase, and maybe it should be one of the first phases, is to do social media monitoring. Why? A good case study in this is re: Netflix and Blockbuster situation. Where we are in the social media lifecycle is the Third Wave. Wave One was lead by the Innnovators. Wave Two was championed by the Early Adopters. So what will it take to get the majority of the business world to buy into social media? The Early Majority are pragmatists. They want assurances that what they are going to do, is gonna work. They want business cases and they’d love to see ROI. One of the ways to show companies that social media matters is all of the above. And one of the best ways to create a business case is to do a little social media monitoring. At least that’s my take! What’s your take on where business is in the social media adoption process? Does this type of social media monitoring data make it easier to understand why someone should invest in social media? Love to hear your thoughts! What is Dreamforce? Does Sassy Know Jargon Will Be Attending? That inspired me to write a post and expand on that topic… here’s some thoughts… love to hear yours! That’s a really good question. You could say its a conference, where analysts, reporters, customers and prospects come together to hear the latest and greatest news about Salesforce. I myself am always looking forward to seeing Sassy… I am wondering if she knows that Jargon is coming this year? He could use some love… (Jargon is the GetSatisfaction’s manifestation of all things not to do in social media… whereas Sassy represents all the things that are on target for this new social customer marketplace.) I have a feeling love is in the air! All kidding aside part of why I look forward to Dreamforce is that I get to see people who are near and dear to my heart. Yes, I know I’m a geek-nerd… and see tech conferences as the time to reconnect with some of the smartest and most amazing thought leaders in the industry. It is home week. I get to see my buddies in from the #SCRM or accidental community as they call it. I get to see friends from PR, Marketing and other disciplines… And we get to banter, evaluate and analyze where the market is, where its going and what Salesforce’s contribution to the next wave of software provides for business. And we get to do some tweeting, some blogging and go see great music, have a beer or two. Life is good. And think that more than anything Dreamforce is really a tribute to doing things differently. You may not agree with everything that’s said there. You may have your own perspective on the where the market is and what you think the week’s events mean for business. But there’s one thing that I think everyone can agree on. Its a week of celebrating doing things different. March Benioff started Salesforce.com 1999. A former Oracle executive he had a vision of doing things different. 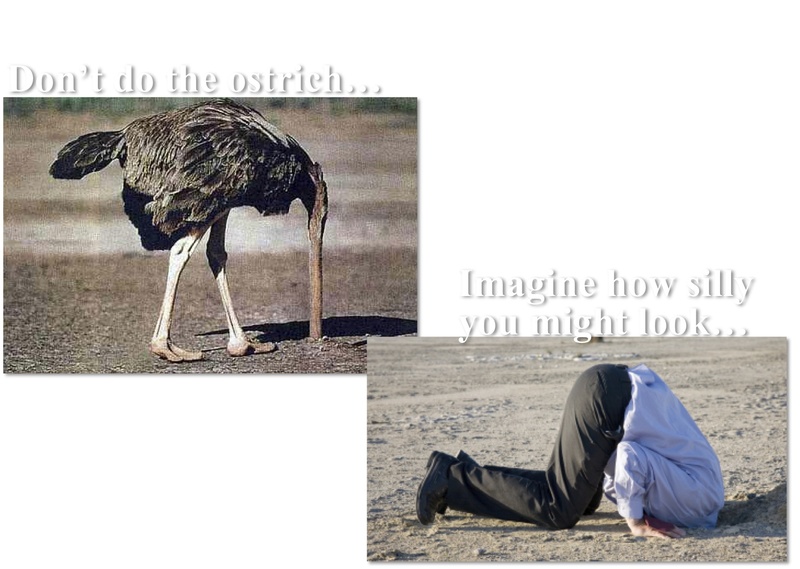 He had the courage to step outside the box and do something so out of the box… literally his software was online… not in a box! In 2004 Salesforce went public, under the stock symbol CRM. Marc’s vision that there was a way to do software differently. He was doubted and criticized. Twelve years later, he is truly someone to admire because his vision manifested into an amazing reality. Why? Because he thought differently and as a result of that thought leader, the whole software world has been dramatically changed. Come hear how companies are thinking differently about Customer Service, Social Media and getting a ROI. Take a note from Marc’s notebook… Think different or die.